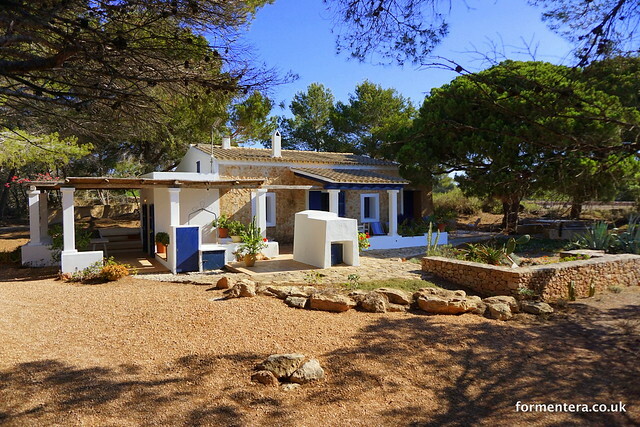 A very well maintained, fully reformed traditional finca in a beautiful area of Formentera. Open views across a vineyard to very distant sea views. Open plan dining/kitchen, very well equipped with 4 ring gas hob. x 2 bedrooms with twin beds. 1 double bedroom with modern ensuite. Spacious separate living room with TV and safety deposit box. Double doors to terrace with sunbeds. Well decorated with tasteful artworks and decor. Superbly clean and well equipped. A lovingly looked after home. Terrace to front of property with access to diner/ kitchen and from double doors to terrace with sunbeds. The house is at the end of the track with very little traffic passing to reach other properties, so the area is peaceful and quiet. The property can sleep up to 6 adults and 2 children.